This is for all those people who watched the World Cup and had a blast cheering on the players in the red white and blue with thousands of your closest friends in bars and viewing parties throughout the twin cities. Now that the USMNT were unfortunately knocked out of the World Cup, you might be thinking, is there any way I can still watch some soccer I’ll care about now that this is over? Sure, you could listen to those people who say that they can only watch European soccer, because the “quality” is so low in the US. But it’s not like you were watching the USMNT team because they were the best team in the World Cup, you were watching them because they are your team. So it goes for local soccer. So why not start following your local soccer team? There’s nothing quite like seeing live soccer, particularly when you have thousands of fans around you cheering them on with you. Live, you really start to appreciate the ebb and flow of the game, as one team, then the other begins to take control of the game. Finally, when the ball finds the back of the opponent’s net, the release of all that pent up energy whips the crowd into a frenzy. Also, unlike any other major American sport, the games only last around 2 hours, and there’s no overtime. So you know exactly what you are getting into. Plus, there’s no commercial breaks that you have to sit through. The game is still designed to entertain the live spectator, not the TV broadcasters. 2. You’ll actually get a chance to meet the players. If you are a fan of other professional sports teams in Minnesota, you’ll be lucky to meet a player or two a season. 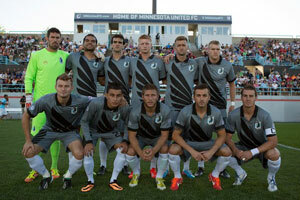 With Minnesota United FC, you’ll have to try hard to avoid meeting players. At viewing parties at Brits team players have been known to show up and chat it up with the fans. Players become fan favorites because they are geniunely good people, who you’ll have a chance to know. In addition, there are countless other opportunities to see the players, as Minnesota is really good about getting players out in the community and interacting with the fans. In addition, the team will come and sign autographs and shake hands after each home game. 3. The supporters are amazing. My wife went to Michigan State, and she talks fondly about her days going to MSU football games and standing in the student section. Or at least she did, until we started standing with the Dark Clouds. The songs, chants and cheers are a blast to sing. Think of it as a cross between a flashmob, a punk rock concert and a college homecoming game. Plus, there’s always a tailgate before the game and most are really friendly and willing to talk, particularly about the team. The team almost went bust two years ago, but Bill McGuire purchased the team, and immediately started investing in the team. While the team struggled last year, this year they’ve looked great. In fact they won the Spring Championship, so they are guaranteed a place in the playoffs at the end of the season. Sure, you’ll be jumping on the bandwagon of a winning team, but trust me, none of the fans care. Alright, I’m hooked, what should I know before I come out to my first game? There’s a lot to know about Minnesota United FC, the Dark Clouds and soccer in Minnesota in general. I’m going to avoid talking about the rules of soccer, because there are a number of great introductions to soccer out there to read. Who are the players I should pay attention to (and can you relate them to USMNT team players)? On the offensive end, watch Cristian Ramirez, he leads the league in goals. He’s our Clint Dempsey or Jozi Altidore, the man the farthest forward who leads the attack. Miguel Ibarra is one of the best players we have, and plays a bit like a more attack minded Michael Bradley, plays in the center of our midfield. Pitchkolan is our captain, and typically plays like Beckerman as our defensive mid. Venegas takes most of our free kicks and plays out wide in the right fullback position, but you’ll catch him pushing forward a lot, much like Yedlin and Johnson did for the USMNT. While Matt Van Okel is not Tim Howard, he does have the greatest facial hair in American Sports. Wait, Minnesota United FC? I thought the local team was [insert name here]. There’s been a number of soccer teams in Minnesota since the 70’s. Minnesota Kicks and then Minnesota Strikers played in the original NASL in the 70’s and 80’s. In the 90’s, the Minnesota Thunder became the local pro team. That team folded in 2009, and NSC Minnesota Stars took their place. That team was then owned by the league, and then by Bill McGuire, who changed the name to the current name. The Loons is the nickname of Minnesota United FC. Kind of like how the Minnesota baseball team is the Twins, but for many soccer teams, the nickname isn’t part of the official name of the team. Who are the Dark Clouds? The Dark Clouds are the inventive, strange and passionate supporters group of Minnesota United FC. They started out supporting the Minnesota Thunder, which is where the Dark Clouds name comes from. Why do people keep referring to Nessie? Minnesota plays at the NSC up in Blaine. Now, say NSC as if it was a word. Get it? Where can I find out more about the club? Besides mnunitedfc.com and following them on facebook, twitter and instagram, you can read news about the team here at The Relegated, at reddit.com/r/minnesotaunited where there is a lively and engaged group who talks about the team, at soccercentric at the Star Tribune or on the Dunord Podcast. You can watch home games up in Blaine or on Channel 45 and away games on NASL live.